The Eastern Barred Bandicoot was once widely distributed across Victoria's western basalt plains, an area of about 23000 km2. They occurred in S. E. South Australia until about 1893. A distinct sub-species occurs in Tasmania, where it is widespread but declining (Backhouse & Crossthwaite, 1995). By the 1980s the Victorian distribution was reduced to a single area around Hamilton, which despite conservation efforts continued to decline until in 1988 the population was about 200. The reasons for the decline in population have been discussed by Brown (1989) and Seebeck et al (1990). The major factors are thought to be loss of habitat and predation by foxes. The importance of the latter may be deduced from the relative abundance of the species in Tasmania where foxes are absent. Other factors such as road kills, predation (of juveniles) by cats and the disease toxoplasmosis spread by cats have been significant in the decline of the Hamilton population because of its proximity to the town. The major habitat requirements are feeding areas with adequate number of invertebrates, and dense cover for refuge from predators. Bandicoots can adapt to highly modified habitat, as demonstrated by "the celebrated case of a population persisting for many years at the Hamilton tip, where they were able to avoid predation by hiding in car bodies and were feeding in the adjacent sheep paddocks" (Backhouse & Crossthwaite, 1995). The first interim management prescriptions were produced in 1982 and a management plan was released in 1989 (Brown 1989). The first action statement under the Flora and Fauna Guarantee Act was released in 1991. Taking bandicoots into captivity for breeding commenced in 1988, and this hastened the decline of the wild population until in 1992 it was considered to be virtually extinct (Clark et. al. 1995). At Gellibrand Hill Park a 1.8m high electric fence was built in 1987 to exclude predators from a 400 ha area of grassland and grassy woodland, known as the nature reserve or "back paddock". 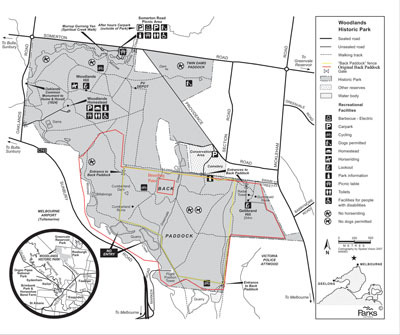 This area was never thought to be large enough to establish a genetically viable population, with the need for "artificial immigration between Gellibrand Hill Park and Hamilton every few generations" being anticipated (Brown 1989). Pens were built inside the back paddock for captive breeding which started in Aug 1988 with one female. Initially there were two pens but by the start of 1990 this had been increased to 16 with a total area of 5.25 ha. 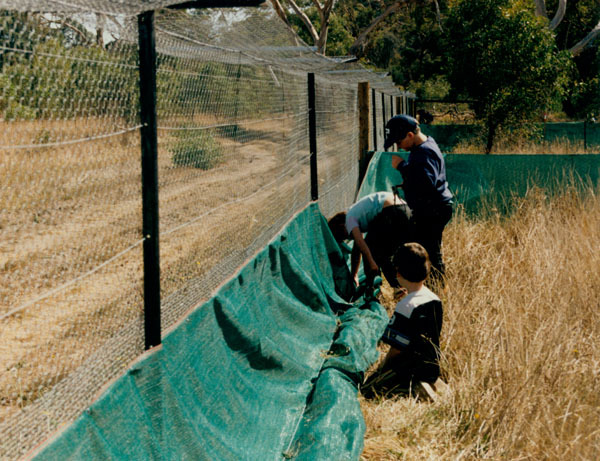 The netting used for the pens allowed juveniles to escape into the reserve. This was later modified but even so it was hard to monitor the number of bandicoots and their health (Winnard and Coulson 2008). In early 1991 captive breeding in cages was started at the zoos where it could be more easily managed. The pens at Woodlands, now subdivided into 30, were not used for captive breeding after Autumn 1992 but were still used for acclimatising bandicoots prior to release at Woodlands or elsewhere. Research in 2005 (Miliano et. al. 2016) found that this so-called "soft release" gave little benefit when the release site was free of foxes, so it is no longer practised. 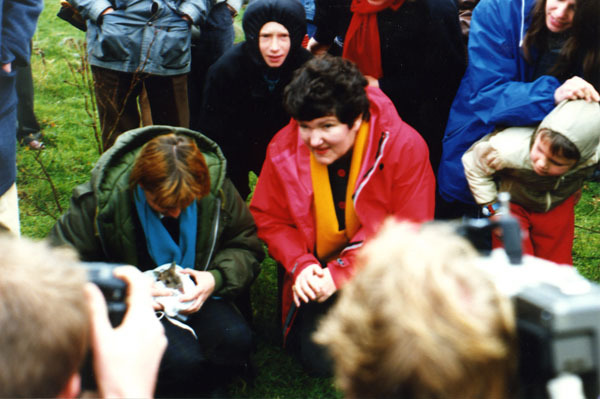 88 bandicoots were released into the back paddock between April 4, 1989 and April 4, 1993. 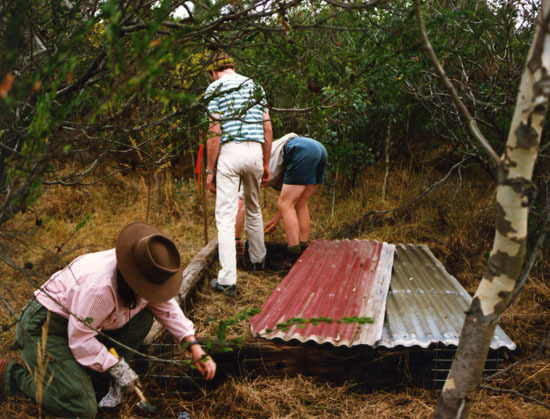 After initial high levels of predation by foxes, low shelters made of sleepers and corrugated iron were built to provide fox-proof bandicoot nesting sites, presumably in an attempt to duplicate the "ideal" habitat of the Hamilton tip. However I am told that the bandicoots did not use them, so presumably they were not a sufficiently accurate imitation of car bodies! The population multiplied to an estimated 500 in Nov. 1993 (Seebeck and Bowley 1994, cited in Todd et. al. 2002). Bandicoot numbers are estimated by cage trapping, unlike Kangaroo numbers which are an actual count. The bandicoot population is believed to have reached a peak of over 600 in 1994/1995 (I assume before the 1994 drought took effect) (Seebeck 1999 cited in Winnard and Coulson 2008). By 1998 the bandicoot population had declined to almost zero. The main reason was the failure to manage the Kangaroo population. As mentioned on a previous page at least 21 Eastern Grey Kangaroos were enclosed when the back paddock fence was completed in 1987. Robertson (1985, page 266) recommended that the Kangaroo population not be allowed to exceed 1 per hectare to avoid negative impacts on other species. However he expected that it would take more than 10 years to reach this level. The first Kangaroo count was held in June 1992 and the population was 200, increasing to 313 the following year. The recommended maximum population would be reached in 1994, 3 years earlier than anticipated, and Park Management and the Bandicoot recovery team would have started pushing for something to be done about it. Unfortunately the bureaucrats or their political masters preferred to wait until it was way too late before taking any action. The Kangaroo count was 730 in 1995, 1023 in 1996 and 1143 in 1997. The drop in growth rate was due to lack of food - rainfall at Melbourne Airport weather station was 310 mm in 1997, the lowest since recording began in 1971 and 43% below average. By 1998 you would have almost needed a magnifying glass to find a blade of grass. The Bandicoots had nowhere to hide and probably not much to eat. 120 bandicoots were removed from the back paddock between June 1994 and October 1996 to stock other reintroduction sites, including 53 animals in November of 1994, which was a drought year. Todd et. al. (2001 and 2002) modelled the population using breeding and survival parameters from a mark-recapture study performed during this period, on two separate 6.25 ha trapping grids. Their model predicted a likely decline in population over 1995 and 1996 even without the removals, despite the fact that the study did not show any decrease in survival rates during the period and fecundity actually increased with higher rainfall in 1995 and 1996. They state that there was in fact a decline in population during this period, but no evidence of this is cited. Low (2002), page 227, mentions a population of 120 bandicoots in 1996. I don't think this is correct, but I do not have have access to any first hand data. Unfortunately nobody involved in the program seems to have published any account of this period. If the population had declined so much by 1996 it simply indicates that there were already too many Kangaroos to allow the habitat to recover from the 1994 drought. Without the removals the bandicoot population may have declined more slowly but the end result would have been the same. On the other hand without over-grazing by Kangaroos the 1997 drought may have caused a decline in bandicoot numbers but not extinction. A small number of captive bred bandicoots were released in 1999 after the Kangaroo problem was addressed and the habitat had started to recover. A further 10 animals were released in July 2001, and intensive trapping over the following 5 weeks detected 4 bandicoots which had been resident in the trapping area before the release (Long et. al. 2005). Of the released animals, 8 were trapped and 3 of these suffered weight losses likely to prove fatal, attributed to the stress of adapting to the wild and fights with resident males. Fox baiting and monitoring were conducted simultaneously, and there was a high level of fox activity although no bandicoot deaths were directly attributed to it. Parks Victoria no longer had sufficient staff to adequately maintain the fence or control predators, and for this reason there were no further releases. Remnant of the original Back Paddock Fence at south-eastern corner of Park, showing single electrified wire on the outside and two barbed wires at the top. Current fence in background. During the rest of the decade the major action at WHP, apart from ongoing valiant efforts at vermin control, was to redesign, relocate and shorten the back paddock fence to make it more predator proof and easier to maintain. The western boundary was straightened and the southern boundary brought north of the creek to eliminate the creek crossings. These changes were in accordance with the 1997 management plan, except that the western boundary excludes more area. Also, the management plan shows the fenced area being extended to enclose the large dam south of the south-east corner of the park, which is part of the Mitchell-Lasry quarry site, expected to have been added to the park. Since this did not occur the back paddock fence was moved further north instead. At the south-eastern edges of the park the fence was brought in from the park boundary so that the outside of the fence could be patrolled. All the fence relocations collectively reduced the size of the back paddock to about 330 ha. I doubt if anybody believed the new fence would be good enough - the recovery team would surely have been aware of research in 1998 and 1999 by the Arid Recovery Project at Roxby Downs in South Australia, which proved the effectiveness of a fence design with a curved overhang as well as two electrified wires lower down. (The curved overhang is usually known as a "floppy top" although it works just as well if rigid.) 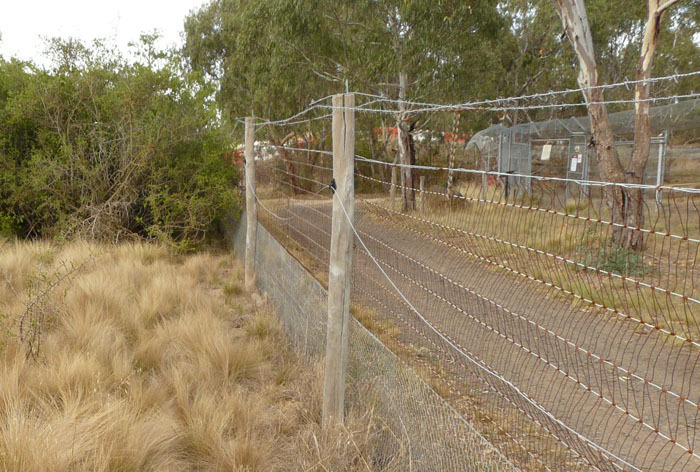 Up to 2004 this was the only formal research into conservation fence design in Australia (Long and Robley 2004 p. 6) although the results were not published until 2006. I can only assume the design used at Woodlands was chosen because it was a bit cheaper to build. Another realignment of the fence was made to exclude the summit of Gellibrand Hill from the back paddock, presumably for the convenience of the public. In 2004 the people in charge of captive breeding decided they had more bandicoots than they knew what to do with, and wanted to release some into the old breeding pens at WHP, which at that stage had been unused for many years. Friends of Woodlands Historic Park helped to rehabilitate some pens and also financed a new water tank. I have no idea if any bandicoots were actually released, or if so what happened to them. I do know that the pens were again unused for a number of years before being demolished. Winnard (2010) performed research into bandicoot monitoring methods in the Back Paddock in 2006/2007. No bandicoots were caught in traps, but their diggings were detected at 16 of 50 randomly selected monitoring points. In 2008 the lack of progress was lamented by recovery team member Peter Myroniuk: "The Recovery Team has no power, no authority, lacks resources and funding.". A triple tautology I think. The fence design has also been modified again with a "floppy top" and no electrified wires. An internal rabbit apron has been added in some places - previously there was only an apron on the outside, so rabbits on the inside could dig their way out, leaving a hole which foxes could get through. New bandicoot releases started in Aug. 2013. So far so good, but there are concerns that the government, having learnt nothing from the 1997 disaster, may be failing to implement the Kangaroo Management Plan. Conservation of threatened species in Australia is increasingly having to rely on philanthropy, donations and tourism rather than government funding. Conservation Volunteers Australia receives some government funding (not via Parks Victoria), but also raises money from donations and by running tours. 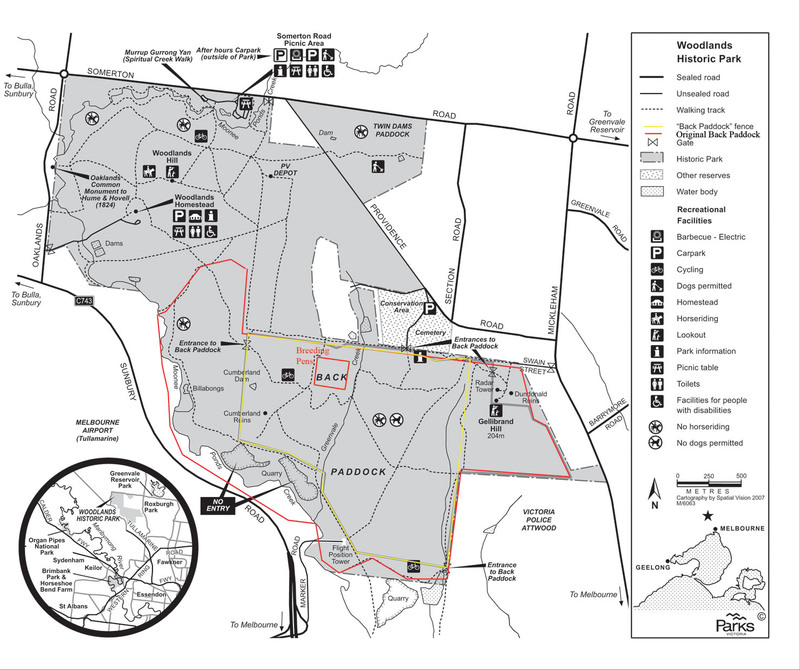 The largest Eastern Barred Bandicoot reintroduction site at present is the privately owned "Mt Rothwell Biodiversity Interpretation Centre" which is dependent on tourism. The smaller Hamilton Community Parklands is being re-stablished as a reintroduction site by Conservation Volunteers Australia. These three sites are not collectively large enough to support a viable population, even with trans-location between the sites, so captive breeding by the Zoos is still vital to maintain whatever genetic diversity remains. The Zoos are funded (curiously) by Melbourne's rate-payers but also of course by admission fees, donations and merchandising. A new 1000 hectare predator-proof site, also privately owned, is being developed at Tiverton Station in south-west Victoria, a more favourable habitat than the dry areas near Melbourne. All the unfenced reintroduction sites which were tried in the 1990s turned out to be fox feeding stations. In 2012 a trial release of Eastern Barred Bandicoots was made on French Island, which is free of foxes but not cats. See the Recovery Team website for details. French island is not within the natural range of the Eastern Barred Bandicoot and its original vegetation is more suitable as habitat for the endangered Southern Brown Bandicoot. No results from the trial have been made public. A release of Eastern Barred Bandicoots has also been made on Churchill Island, which is fox and cat free but too small for any purpose except research.